A burgeoning beer business is brewing in North Carolina — and NC State is supporting it. A burgeoning beer business is brewing in North Carolina — and NC State is supporting it with innovative brewing techniques, hands-on training for future brewers and a project to jump-start hops production in the state. In the decade since the state General Assembly popped the cap on making and distributing beer, 130 breweries have bubbled up around the state. Their work generates $791 million in annual economic activity and employs 10,000 people, according to the North Carolina Craft Brewers Guild. More than a fifth of those breweries are in the Triangle, and NC State shares more than a home region with them. We’re teaching the hard science behind high gravity to future brewers and helping connect North Carolina farmers with North Carolina brewers. When John Sheppard was asked to brew beer from wild yeast, he was skeptical. Humans have been brewing beer for millennia; if yeasts that could make a good pint were out there, they would surely have been found long ago. Sheppard set out to prove himself wrong. 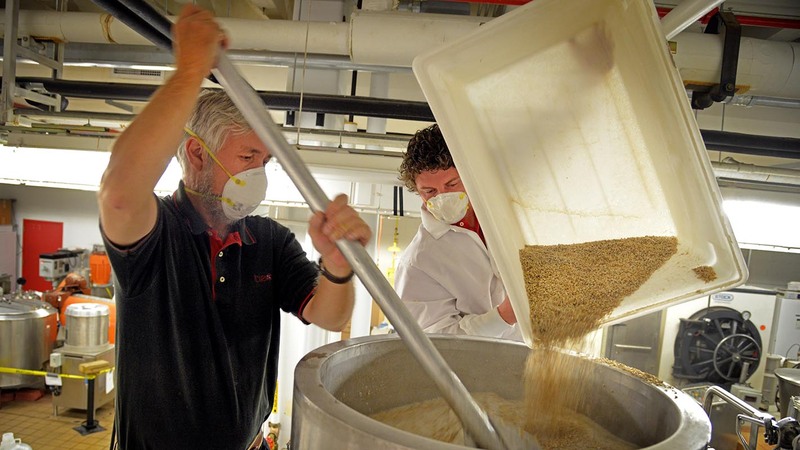 A bioprocessing professor at NC State, Sheppard is both a beer brewer and a scientist. His research focuses on the art and science of turning water, hops, malt and yeast into ales and lagers. In 2014, representatives of the North Carolina Science Festival approached Sheppard about developing an exhibit on the science of beer for the World Beer Festival, which was being held in Raleigh. They suggested he work with NC State biologist Rob Dunn to find wild yeasts and use them to make beers that could be sampled at the World Beer Festival, offering attendees a tasty and accessible way into the microbial biology of the natural world. Sheppard’s initial skepticism was well-founded: Of all the hundreds of different species of yeast, many of which include different strains, only two are typically used in making beer. A brewing yeast needs to be able to do two things: it has to “eat” maltose (the sugar in malt) and produce ethanol efficiently. Most yeasts can’t do either, much less both. But Sheppard was willing to give it a shot. He reached out to Dunn, who reached out to the people in his research group — one of whom, Anne Madden, was a postdoctoral microbiologist and expert on the tiny organisms that live on insects. Because of her background, Madden knew that paper wasps are home to communities of yeasts, some of which are associated with winemaking.By taking samples from the wasps, sheultimately isolated a wild species of yeast that had never been used for commercial brewing. She shared it with Sheppard, who culturedthe yeast and brewed with it. The results were not what he expected. “That first batch produced a really sour beer,” Sheppard says. “But when we served it at the World Beer Festival, people loved it.” And, since people loved it, the researchers did it again. What they had found wasamazing. By making small adjustments to the brewing process, the wild yeasts produced very different flavor compounds, called esters. Some of the ales tasted like sour beers, some like honey, some like apple cider. And these characteristics could be extremely useful for brewers. NC State is the perfect place to connect the basic biology and the application. Once they realized the potential of these wild yeasts, the researchers began collecting data on how these yeasts grow and precisely which esters they produce.They also worked with NC State to file an invention disclosure to protect their intellectual property and secured financial support from the Chancellor’s Innovation Fund, which helps researchers move innovative concepts from the laboratory to the marketplace. Barley malt ready to be made into beer. In his research with Dunn, Sheppard focuses on finding innovative ways to brew beer. But he spends most of his time teaching students the fundamentals in a place most people don’t know exists: the brewing lab in the basement of Schaub Hall. Sheppard, a faculty member in the College of Agriculture and Life Sciences, says it’s the interaction between science and the practical aspects of making an improved product that is attractive to his students. Dr. John Sheppard, coordinator for the undergraduate Bioprocessing Science Program, stirs malt while student Brandon Jackson (right) pours in the brewing lab at Schaub Hall. The brewing lab produces five year-round beers: Pack Pilsner, Chancellor’s Choice IPA, Brickyard Red, Ma Blonde D’or (Golden Blonde) and Schaub Schwarzbier. It offers four seasonal brews, too: Wolf-toberfest in the fall, Pullen Porter in winter, Graduator Maibock in spring and Wolfpack Wheat in summer. For now, those beers are available only at events on campus, although Sheppard said the brewery recently got a license that willeventually allow themto be sold at the Lonnie Poole Golf Course, the University Club and other public-facing places on campus. Wherever its beer may end up, the brewing lab’s focus will stay on teaching the science of beer and preparing the workforce for the state’s burgeoning beer industry. But the skills learned in the lab have broad application, said Claire Svendsen, a master’s student in food science. Variety of beers on tap at Raleigh Brewing. Sculptors, farmers, philosophers — craft brewers start out as many things before their true passion seizes them. NC State alumnus Scott Craddock is one of the few with a hard science background, having graduated from NC State in 2009 with a degree in biology. Having that strong science background that NC State provided me really allowed me to flourish in the brewing community. Craddock began dabbling in home brewing in his final years of college. After graduation, he and his wife moved to Fort Collins, Colo., where Craddock learned his profession at various breweries in the area. 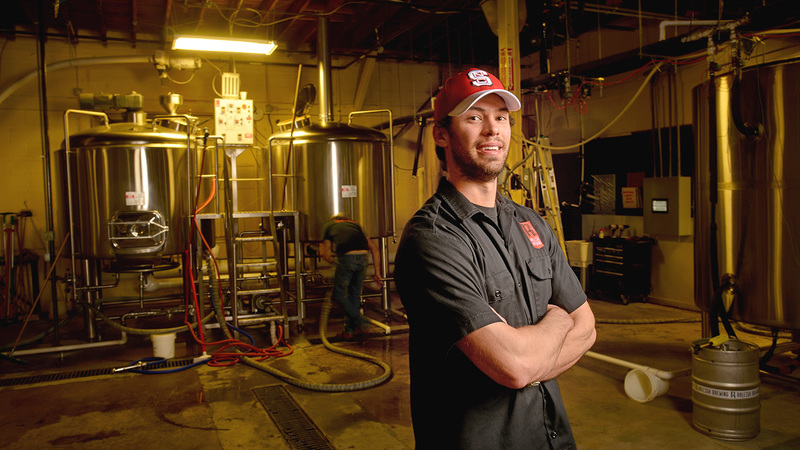 NC State biology alumnus Scott Craddock is now a key member of the brew team at Raleigh Brewing Company. That background also inspires Craddock’s ongoing experiments with alternative yeasts and bacteria. Today he’s a key part of the brew team at Raleigh Brewing Company, just a stone’s throw from NC State’s campus. The company has enjoyed a rapid rise in recent years that mirrors that of the statewide beer industry. Raleigh Brewing Company can’t brew beer fast enough to keep up with that surging demand, despite roughly doubling its production in each of the last three years. And it’s just one of some 30craft breweries now dotting the Triangle. 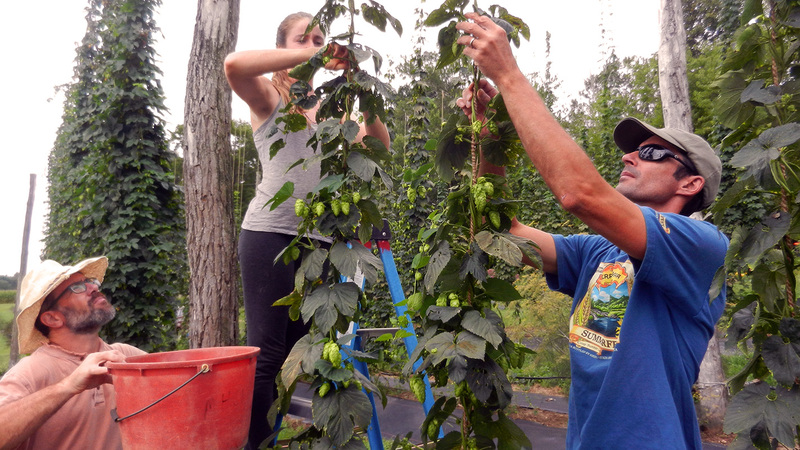 As the craft brewing industry continues to expand in North Carolina, farmers are looking to capitalize by planting hops, a key flavoring and stability agent in beer. But there’s one problem: North Carolina lacks the long days and cool weather of the Pacific Northwest, long the prime region for hops production in the United States. So traditional growing practices don’t produce the high-quality hops that brewers want. Enter the North Carolina Hops Project. Six years ago, NC State’s Department of Horticultural Science launched the project to adapt hops growing to the region’s climate. It uses valuable research to educate all parties involved in brewing, including growers, brewers (from independents to corporate giants) and other industry professionals on how to better work together to improve brewing in the state. The project’s location at the Cooperative Extension Service’sMountain Horticultural Crops Research and Extension Center in Mills River, N.C., puts researchers close to many of the major brewers and growers in the state. North Carolina Hops Project employees Reuben Travis (left) and Leonora Stefanile (center) work alongside Adam Wallace (right) of Sierra Nevada. Credit: Jeanine Davis’s Alternative Crops and Organics Program. Over its six years of existence, the project’s work has evolved a great deal. “When we began the project, we discovered that variety trials were what growers needed most,” said Jeanine Davis, project director and associate professor in theCollege of Agriculture and Life Sciences. These trials experiment with a number of different hops varieties to determine ideal growing conditions. But as researchers learn more about how existing hops varieties respond to North Carolina’s climate, they are broadening their focus to include breeding varieties that are ideally suited for local growing. The project’s education and outreach efforts have also multiplied in recent years. One new initiative is a three-year partnership with Virginia State University on an education and outreach project to help growers understand more about the industry, particularly its economics. The North Carolina Hops Project is seeking to establish collaborative and financial partnerships with interested brewers, growers and individuals. In addition to their work with approximately 50 growers statewide, researchers are also collaborating with the many breweries that have moved into the state in recent years. Sierra Nevada, a leading U.S. brewer, recently opened a brewery and taproom adjacent to the Mills River research center and has been particularly interested in the hops project’s work. Project representatives have taken Sierra Nevada employees to visit local growers who may supply hops for some of the small-scale beer batches the company serves in its taproom. The collaboration with Sierra Nevada has been beneficial for the hops project as well. Project researchers were experimenting with growing a new high-yield variety of hops but were uncertain how it would taste when brewed. Where in the Triangle can I taste your beers? I really want to try bumblebeer! Where can I go to get a NC State beer? I’m a staff member, current student, and alum. We’re debuting a few bug beers at this year’s Night of Natural Selections on August 19th, at the North Carolina Museum of Natural Sciences in Raleigh. Come with some wolfpack pride and leave with a few quaffs of NCSU brews. Proud of the research and development that continues at my university,NC State. Thank you for sharing this information. It is really neat to see all that is being done to promote the beer industry in NC. Keep up the excellent work!